As of late, Martha Stewart, baking and food blogs seem to go hand in hand. 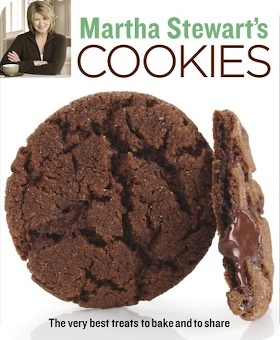 With Sunday's launch of the cookie-centric contest at marthastewart.com, it is an appropriate opportunity to take a closer look at the prize up for grabs; copies of Martha Stewart's Cookies (Clarkson Potter, 2008). The latest cookbook from the editors of Martha Stewart Living, it is a comprehensive collection of 175 their most versatile and tempting treats. With its ingenious imaged-based table of contents, coupled with chapter headings organized by cookie texture, this book speaks directly to cravings and their indulgence. I have read some recipes delightfully described as "everyday", a phrase that evokes idyllic notions of an overfilled cookie jar; these are chocolate chip cookies in a myriad of variations, fudgy brownies, delicate sugar cookies and shortbread. Other recipes range from the festive (from Crumbly and Sandy: Vanilla-Bean Spritz Wreaths) to the elegant (from Crisp and Crunchy: Sweet Cardamom Crackers) to the downright decadent (from Rich and Dense: Chocolate Pistachio Cookies). In regards to content it should be noted that some of these recipes have been previously published in various publications under the Martha Stewart mantle, specifically the special edition Holiday Cookie series. Some readers could be frustrated by this repetition, while others may appreciate having their best-loved favourites in a trade paperback version. The layout of the recipes is clear and concise, each featuring a photo of the finished product. Although some follow the expected Martha Stewart aesthetic of colourful but simple styling, others depart from this look entirely. These shots are mid-range to close up photographs against a white background which, in comparison to the charm of the former, do seem a bit austere. That said, the minimalist approach does highlight the characteristic textures of the cookies quite well. Two appendices, one on packaging and the other with information on techniques and cook's tools, are helpful additions. Inspired presentation ideas show off the cookies beautifully for giving, and the instructions frequently include step-by-step photos. The baking notes serve as a useful introduction to the novice baker and as helpful reminders to those more experienced. In the name of research, the Peanut Butter and Jelly Bars (above and below) were the first to be made from this book. The luscious batter inspired nostalgic thoughts of childhood. Its rich scent reminiscent of the best peanut butter cookie crossed with Reese Pieces; the sort that has greedy fingers fighting over rights to lick the bowl. The finished cookie lived up to the charms of the dough, with tender cookie underneath, a layer of tangy-sweet jam in between and the salty crunch of peanuts and crisp crumble as a crowning crust. Perfect for a lunchbox or after-school treat, these cookies will surely become a household classic. From Martha Stewart Holiday Cookies 2001. The recipe featured in the book is subject to copyright but is quite similar to this version. 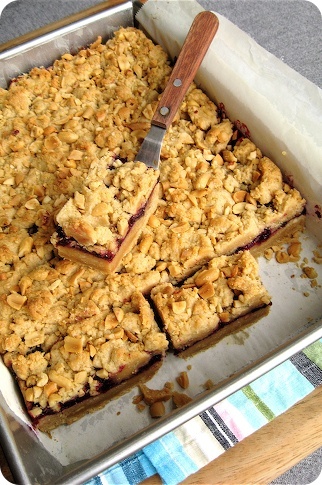 • I used a combination of mixed berry jam and homemade mixed berry compote for the filling as I wanted a bit of tartness to offset the buttery-rich cookie layer. • Toffee bits, coconut, honey-roasted nuts or white chocolate chips would be a wonderful substitution or addition to the peanut topping. For those looking for true excess, a chocolate spread or dulce de leche could be used instead of jam filling. Tasty! I have been seeing this book around, thanks for the review. Wonderful review. You inspire me to get out my baking sheets and try a few recipes. I actually had this recipe bookmarked online for quite some time now but haven't gotten around to making them. Who can resist peanut butter and jelly? Thanks for the review on the book. I bought her new classics cookbook and was rather disappointed but this one looks promising. Your bars look great! I bought this book a while ago, and I absolutely love it! I use it all the time and it is my go to book when I need a good sweet! I also have her, Great Food Fast Cookbook and I love that for dinners. I thought it was so funny that I just made these last night, and then found them on tastespotting in the morning. What a coincidence. anonymous, I hope you do - if you have the book there are some great, simple treats. amanda, sorry to hear that you were disappointed with the New Classics book - was it something in particular? I would heartily recommend these bars. steph, glad to hear that the book is retaining its charm - I just got it recently, so am still making my way through! madeleine, what a coincidence; how did you like them? The recipe you've linked is in my post already ("The recipe featured in the book is subject to copyright but is quite similar to this version." The word version is the link) but thank you for pointing it out to others. I just got this book and can't wait to try out some of the recipes, those bars look great! I am in love with this book. I have only made 2 recipes from it so far (one AMAZING and the other just ok) but I love looking through to see all of the pictures of the cookies. I have many more bookmarked! Tara, I think those are the best looking bars ever--and a peanut butter cookie crossed with a reese's pieces sounds about as good as it gets. What is it about peanut butter that just brings out the kid in us? Wonderful review by the way! The Barefoot Contessa made something almost like this on her show last week --- seemed very easy and yummy. i really enjoy your blog and as an artist, especially the photos! brilynn; thanks for saying! It would be great if you reported back on any recipes you decide to try. deborah, which cookies did you make? I would love to hear your specific thoughts. kelly-jane, I'm glad you enjoyed the review and liked the photos. michèle; personally I might have added a bit more jam, but I was always one that loved squishy-jammyness of a PB&J. I'll make sure to earmark a tray for you and G.
susan, I have seen that recipe as well; I do think a side-by-side comparison might be in order! For those interested, http://www.foodnetwork.com/food/recipes/recipe/0,1977,FOOD_9936_31589,00.html" REL="nofollow">here is a link to Ina Garten's version. stephanie levy, thank you for the compliments! Oh snap! I just looked at the image used on Martha's website for this tasty treat and it doesn't hold a candle to your decadent portrait. Great shot! Now I totally have to make these. I've been lusting after this cookbook but have put in place a self-imposed cookbook buying moratorium for a bit. Though Christmas will be here soon . . .
i buy the book and i try it at home ..thanks for this blog.